Marg and I are still quilting away. Now we're making a couple of wheelchair lap quilts. Quick to sew tops is what we're after. Since Marg has a 6 inch square ruler, we try to use it whenever we can. Here's the first quilt we put together. We adapted Katie Blakesley's free pattern called "Star Bright." At first we were going to add a dark border but Marg came across this lime green fabric and we thought it was perfect. The next quilt we are putting together is in pink and purple. 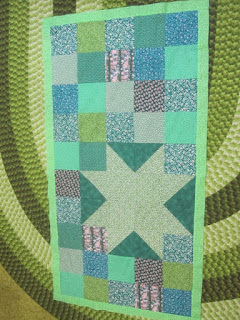 Lovely small quilt, and at first I thought the border was what the quilt is lying on, those curves look great!!! I like this one (and the rug behind it!). Your different versions of this pattern are all very pretty. You are doing such great work to help others.